Hi, all! Feeling fine from root canal work. I didn't know WA had earthquakes! Terrible fire in CA. 1:48. Good Morning Wolf, Anne and all who follow. Guess I'll have to look somewhere else for sunshine! I wonder if Snowbird has left yet? Good Maen, good people. Woke up to the first snow of the season. Better than ashes. Easy solves 1-&GT;9 except for two 3s and three 6s that need to be filled at the end. I couldn't find another pattern that worked better. Everybody!! Off to Reno for two day cribbage tourney. Hope the cards run good! Hello all - Does one wish a Reno Cribbage player 'Good Luck'? If so, here's to your luck working correctly, Denny! The other option is, ''Break a leg,'' but maybe that's only in the theater. Pretty sure that's for theater only, Keith. 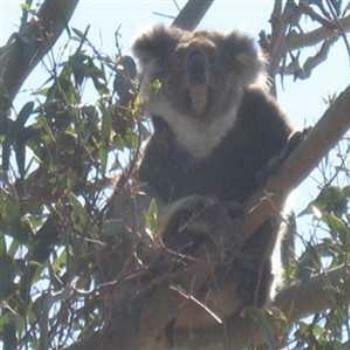 Morning all,great photo of the Koala,Vici. Put my first load of washing on then looked out then window to find the sky covered with big dark clouds. Oh well, can always hang them under cover. Vici lives around 50 miles away from the Camp Fire, so she's safe, but probably getting smoke. Looking at this photo, we can see where the teddy bear got his looks! Koalas are so cute! Yesterday was so sunny and bright that today's dark sky and steady rain are all the more gloomy. Life has been so busy since I have become the “granny nanny” for my grandsons. We have officially moved to Virginia and have sold our Michigan home. My goal this next year is to get all my boxes unpacked! I had the 3 little kiddos yesterday and will continue on Thursdays at least until the middle of December, so, I'm a ''granny nanny'', too, Debby. Well, great-granny nanny in my case. I guess the nasty weather is all along the east coast. It was raining when we left Charlotte this morning and lasted all the way down to Columbia. It had quit by the time we got home, but it's still overcast. Nice to see you, Debby! You'll need to change to Debby from Virginia or Debby from the Blue Ridge or Debby from Down Yonder ... or something like that. It's too early for a drink. At least we still have a way to go until 33. So I'll post a thankfulness post for today. I'm thankful for Wombat's poozles! Comic Sans, Helvetica, and Times New Roman walk into a bar. An amnesiac walks into a bar. He goes up to a beautiful blonde and says, “So, do I come here often? A neutron walks into a bar. How much for a beer?” the neutron asks. And this is a CP. Whoo hoo.